Have real Faith, be lions and fights for life's noble mission. Eknathji elaborates above by giving detail explanation, that this faith in man is of two types: one is intellectual faith and the other is practical or real faith. A person may have an intellectual grasp of the immortality of soul. But whether the principle has been imbibed deep enough in his heart and whether the principle has been imbibed deep enough in his heart and whether it is reflected in his day to day life, is the question. Means if a man does not rise to the occasion and is not prepared to die for the most noble and ideal value in his life, being afraid of death, it clearly indicates that all his glib talk about the immortality of the soul and the nobility of life's mission and fulfilling life's goal at any cost, signifies nothing. Intellectual faith makes man a sheep, while real faith turns him into a lion. Have real faith, be lions and fight for the life's noble and sacred mission. कृण्वन्तो विश्वम् आर्यम् । We will make the whole universe noble. Together with such systems, we have also lost certain good qualities of life. Our philosophical and secular literature is full of evidence which shows that the ancients had immense self-confidence in them. कृण्वन्तो विश्वम् आर्यम् । We will make the whole universe noble. was their vow. Eknathji says, they had such immense trust in themselves that if they desired and decided, they could do and undo things. They declared the immortality of the soul and accepted the potential divinity of each soul, thus facing death boldly with as great a joy as one would change the old clothes and take new ones. What grief is there and why weep when one changes the garments? We are born and therefore we must die, and die not eternally but die to be born again with a new body with all the vigour and luster for a fresh life. Eknathji further explains, they ancient seers developed the theory of 'reap as you sow' and therefore, the future of every individual, was not the idiosyncrasy and the fanciful will of any superior master or overlord, but it was in his hands. But we have lost that. If anybody, by this efforts and firm will achieves greatness, we immediately attribute the same to his being a superhuman being, because we have lost all self-confidence in ourselves and we want to conceal the inferiority complex and the diffidence. The great man is immediately turned into an avatara and we try to escape the responsibility of emulating the outstanding and ideal qualities of the person. Swamiji rightly observed, "He is an atheist, who does not have faith and confidence in his own self." We have to revive that potentiality and self-confidence. Eknathji emphasis, Fearlessness is another superb quality which we have lost. Such enormous youth power we have, but it is wasted as our youths are chicken-hearted. There is no sense of adventure, we are terribly afraid of death. We speak of high principle but live just the contrary. Our concepts, beliefs and faiths move in one direction and our stream of life flows just in the opposite direction. It's a very brave and fearless philosophy of our ancients, but we have forgotten it, and live a pitiable life. Eknathji conclude by saying, We must remember the glorious past of our ancients and must make bold to revive all those ideal virtues and values of life which we have lost and forgotten. In the book 'Basics and Dynamics of Organisation', Mananeeya P Parameswaranji brings out clearly as to how India was organised even till the dawn of British period. He says : Every organisation has got that central theme around which all these things revolve. Mananeeya Eknathji emphasises this point that we were one of the most well organised society. This organised condition continued even till the British period. Even during the Moghul period, the Muslim period, these organisations did exist. They performed their duties. May be there were problems, challenges, difficulties, lack of finance, lack of governmental support, rather opposition from the government. But with all that, these things were maintained even during that period. But then, during the British Period, knowing our strength lies in these various institutions, they interfered with every system, every vyavastha and made us feel dis-organised. Mananeeya P Parameswaranji very succinctly brings out this fact. He says : The blow came during the British period. It was at two different levels. One, at the open level - taking away the financial support and making them almost incapable of surviving. The other was that systematically they made people lose faith in these institutions. People were told that these institutions were backward, not modern enough, not conducive to the situation of the present age. So these must go. They are irrelevant. They are outdated. They have no role to play. Our education system was replaced by the western education system. Every sphere met with the same fate: the faith that sustained these institutions was removed. Once the faith was lost, only the shell remained. Moreover, in the name of all kinds of reforms such as land reforms, the economic support was also withdrawn. The whole structure collapsed. That is how the organised structure in every area of life crumbled during the British period. There was need for restructuring, or innovating, or creating something new. Towards the end of the British period, this was more particularly felt. That was what Swamiji meant when he said that we have to create an organised condition. Not that we never had it, but much of it had crumbled. It had lost connection with the life current of the people. New institutions had to be evolved. Mananeeya P Parameswaranji gives us examples to make us understand how we had organised life of our own style. He says : Sri Aurobindo has taken up this question in his 'Foundations of Indian Culture'. Towards the end where he deals with the question of Indian polity, he examines it threadbare and says how we had a very scientific and a very well ordered organised existence. He has explained in detail. Even foreign scholars have recorded their observations that Indian polity has been one of the most well organised systems in the whole world. Our Panchayat Raj for example. But for this Panchayat Raj, our country would have been smashed to smithereens by these foreign aggressors. We were able to withstand all these onslaughts because of the powerful existence of the Panchayat Raj, which are called the republics, the village republics of India. They survived through all these ages. Take a look at the Shankara Maths. The Math was established by Adi Shankaracharya, may be in the eighth or ninth century, even according to calculation by Western scholars. Even today they continue to exist as powerful and inspiring centres for social, cultural and religious guidance of the entire society. Such wonderful stamina they have!. Take the temples, for example. Party offices are set up yesterday. They collapse today. But temples continue through the ages. Even in the most decadent form, somebody will light a lamp there. The continuity is maintained. Sometimes they fall on evil days but again they recover. Through ups and downs, the continuity is there. So there is an organisation. There have been many studies on it, many of us have also read about them. Similarly temples. There are temples confined to one village. There are temples which are meant for a group of villages. There are temples which are for the whole nation. There is an intricate web of relationship. The society is interwoven with all these institutions. A very marvellous system of organisation has been there in all these spheres. Hence we know organisation is not something that is new to us. Organisation is in our blood. What is more, that organisation is according to our own necessity, of our own type! We have given the organisational structure, the ethos, the inspiration from our own view of life, our own spiritual mission of reality. Organisation – a Gift from the West? When we talk about organisation, many times we are reminded of what Swamiji said when he went to the West, how he had fallen in love with organisation. That sometimes creates a notion that organisation is a speciality of the West and we have nothing of the kind here. We are new to it. We are a disorganised people. There is no sense of organisation. All are individualistic. India had never been organised. The charge is very often levelled that India has never been a country, never been a nation, it has always been scattered into pieces. So the sense of organisation is something modern and that has come only from the West.It is alien to us. This sort of a feeling sometimes is created. Swamiji himself has in many places tried to place before us how this country has been evolved from immemorial ages, how we have our own kind of organisation, how the social life was organised, how the cultural continuity was the result of organised social life - all these aspects we are aware of. Mananeeya Eknathji also pointed out that even though today we appear disorganised, this was not our condition. Probably we were the most well organised nation in the whole world. But for that sort of an organisation, this country could not have existed, survived all the onslaughts for so many millennia. We were one of the most well organised nations of the world! Mananeeya Eknathji gives the example of the Varnashrama Vyavastha. 'Vyavastha' means an organised state of existence, a system. In India we have had it right from Vedic times. It is that Vyavastha, the Varnashrama Vyavastha, that has been holding us together through thick and thin, through good periods and bad periods, through degenerations also. Even though the system degenerated, the country continued to exist because of this organised social setup that we had. It is not only in Sanatana Dharma. In every sphere, we had our own type of organisation. "Fearlessness is another superb quality which we have lost. Such enormous youth power we have, but it is wasted as our youths are chicken-hearted. They become homesick when they are away from home. There is no sense of adventure. We are terribly afraid of death. The Gita chanting and the Upanishadic recitations that we do are only a remnant of the past glory. We speak of high principle but live just the contrary. Our concepts, beliefs and faiths move in one direction and our stream of life flows just in the opposite direction"
The website has been started on Rashtra Chintan Diwas, a First day of Samartha Bharat Parva, and till now 12,86,455 Suryanamskars have been registered. Now Branch Center can upload the photographs directly to Gallery, please contact concern Prant Sangathak or General Secretary for the more information. Mananeeya Eknathji has great confidence on the ancestors and the work they did. He firmly believed that Organization was integral to our social life. Further he said : The welfare of the society being the goal of social institutions, the Varnashrama system in one form or the other, with the name or without it, will continue to exist so long as nature has been skilful in providing a variation in the individual equipment by furnishing different aptitudes to different persons and so long as the society needs those aptitudes for its maintenance. The soundness of the Varnashrama system is found in its hereditary character, though it can be reckoned now as a drawback. But every social institution has its good points as well as bad points. And we look at this particular institution just to prove how organization was an integral part of our corporate social life. Its merits and demerits can be examined separately. Swami Vivekananda too was proud of the ancestors and the work done by them. His total faith on the wisdom of our ancestors, Rishis made him proud of our nation. He says : There is a law laid on each one of you in this land by your ancestors, whether you are Aryans or non-Aryans, Rishis or Brahmins, or the very lowest outcasts. The command is the same to you all, that you must make progress without stopping, and that from the highest man to the lowest Pariah, everyone in this country has to try and become the ideal Brahmin. This Vedantic idea is applicable not only here but over the whole world. Such is our ideal of caste as meant for raising all humanity slowly and gently towards the realisation of that great ideal of the spiritual man who is non-resisting, calm, steady, worshipful, pure, and meditative. In that ideal there is God. The old Aryan institution of the four castes and stages of life. The former comprise the Brâhmin, Kshatriya, Vaishya, and Shudra, and the latter, Brahmacharya (student life), Gârhasthya (house-holder's life), Vânaprastha (hermit life), and Sannyâsa (life of renunciation) processes never found a place. And I ask you, fools of my own country, would there have been this institution of Varnashrama if the Aryans had exterminated the aborigines in order to settle on their lands? The object of the peoples of Europe is to exterminate all in order to live themselves. The aim of the Aryans is to raise all up to their own level, nay, even to a higher level than themselves. The means of European civilisation is the sword; of the Aryans, the division into different Varnas. This system of division into different Varnas is the stepping-stone to civilisation, making one rise higher and higher in proportion to one's learning and culture. In Europe, it is everywhere victory to the strong and death to the weak. In the land of Bhârata, every social rule is for the protection of the weak. Mananeeya Ekanthji harps upon another important quality of fearlessness to which Bhagavan Sri Krishna also has given first number while talking about Daivi Sampat : ABHAYAM. With this quality, our forefathers went across the oceans and conquered the world with their fearlessness. He therefore, says : Fearlessness is another superb quality which we have lost. Such enormous youth power we have, but it is wasted as our youths are chicken-hearted. They become homesick when they are away from home. There is no sense of adventure. We are terribly afraid of death. The Gita chanting and the Upanishadic recitations that we do are only a remnant of the past glory. We speak of high principle but live just the contrary. Our concepts, beliefs and faiths move in one direction and our stream of life flows just in the opposite direction. Swami Vivekananda, the fearless lion monk of ours said : Advance, forward, O ye brave souls, to set free those that are in fetters, to lessen the burden of woe of the miserable, and to illumine the abysmal darkness of ignorant hearts! Look, how the Vedanta proclaims by beat of drums, "Be fearless!" May that solemn sound remove the heart's knot of all denizens of the earth. Let us proclaim to every soul: Arise, awake, and stop not till the goal is reached. Arise, awake! Awake from this hypnotism of weakness. None is really weak; the soul is infinite, omnipotent, and omniscient. Stand up, assert yourself, proclaim the God within you, do not deny Him! Too much of inactivity, too much of weakness, too much of hypnotism has been and is upon our race. O ye modern Hindus, de-hypnotise yourselves. The way to do that is found in your own sacred books. Teach yourselves, teach everyone his real nature, call upon the sleeping soul and see how it awakes. Power will come, glory will come, goodness will come, purity will come, and everything that is excellent will come when this sleeping soul is roused to self-conscious activity. Ekanthji concludes : It was a very brave and fearless philosophy of our ancients, but we have forgotten it, and live a pitiable life. We must remember the glorious past of our ancients and must make bold to revive all those ideal virtues and values of life which we have lost and forgotten. We have a large number of gods and we can borrow as many more gods if required but that will not make us theists. We have to revive that potentiality and self-confidence. Swamiji very beautifully says : He is an atheist who does not believe in himself. Those of you who have studied that most beautiful Of all the Upanishads, the Katha, will remember how the king was going to make a great sacrifice, and, instead of giving away things that were of any worth, he was giving away cows and horses that were not of any use, and the book says that at that time Shraddhâ entered into the heart of his son Nachiketâ. I would not translate this word Shraddha to you, it would be a mistake; it is a wonderful word to understand, and much depends on it; we will see how it works, for immediately we find Nachiketa telling himself, "I am superior to many, I am inferior to few, but nowhere am I the last, I can also do something." And this boldness increased, and the boy wanted to solve the problem which was in his mind, the problem of death. The solution could only be got by going to the house of Death, and the boy went. There he was, brave Nachiketa waiting at the house of Death for three days, and you know how he obtained what he desired. This Shraddha must enter into you. Whatever of material power you see manifested by the Western races is the outcome of this Shraddha, because they believe in their muscles and if you believe in your spirit, how much more will it work! This Shraddha is what I want, and what all of us here want, this faith in ourselves, and before you is the great task to get that faith. Give up the awful disease that is creeping into our national blood, that idea of ridiculing everything, that loss of seriousness. Give that up. Be strong and have this Shraddha, and everything else is bound to follow. This is how each one needs to stand on one's own legs and work with confidence so that one can start further reviving the national ideals which are forgotten. Having told about the necessity of regaining what was lost, Mananeeya Ekanthji says : We can mould our future. Swamiji had said : You are the maker of your own destiny. It all means, everything is in your hand. If you think positively, you will become positive, you will contribute positively. Hence, to make or mar is in your hand. Now that we have this national work in our hand, we need to take the things positively and work. Mananeeya Eknathji further says : The ancient seers developed the theory of 'reap as you sow' and therefore, the future of every individual, was not the idiosyncrasy and the fanciful will of any superior master or overlord, but it was in his hands. But we have lost that. If anybody, by this efforts and firm will achieve greatness, we immediately attribute the same to his being a superhuman being, because we have lost all self-confidence in ourselves and we want to conceal the inferiority complex and the diffidence. The great man is immediately turned into an avatara and we try to escape the responsibility of emulating the outstanding and ideal qualities of the person. In this regard, we have the incident in the life of Eknathji itself. It goes....The nation was full of grief over the demise of Lokamanya Tilak, the moving spirit behind the freedom movement. His work for the freedom and regeneration of India was immense. The awakening he brought to the people of India and his voluminous work, the Gitarahasya, were unparalleled. The appreciation, admiration and the devotion of the people of India for his work were reflected in the huge cutout at the exhibition held during the Congress Conference at Nagpur in 1920. He was shown with four hands carrying Shankh, Chakra, Gada and Padma. Many visited the exhibition. A young six-year-old boy amongst them alone was puzzled by the huge cutout. "Who is he?" he asked his mother. "Why does he have four hands?" asked the boy. "He did a lot of work for our country". "But is he a God?" "He worked like a God for our country". "God's power is there in all of us". "That is true, but is he a God or man?" "But then why should he be shown with four hands?" "As I said earlier, because he has done a lot of work." "But did he actually have four hands?" God", said the exasperated mother. "But when he was a man, why four hands are…?" man works very hard he can work like God." Though Nath kept quiet, he never forgot the incident. Though it intrigued him, he learnt two lessons from it. If an ordinary person works for the country very hard, then he could work like a God. By calling such a person a God or an incarnation of God, people shirk the responsibility of raising themselves to that level. The incident became a landmark in the life of young Nath. His life is a journey from the ordinary to the extraordinary, seeking inspiration from great persons instead of considering them as incarnations. It was at this young and impressionable age that he came in contact with the fiery patriotic personality, Dr. Hedgewar. Mananeeya Eknathji till now has given the history of Organised efforts that were done in our country. As Swami Vivekananda says : The social laws of India have always been subject to great periodic changes. At their inception, these laws were the embodiment of a gigantic plan, which was to unfold itself slowly through time. 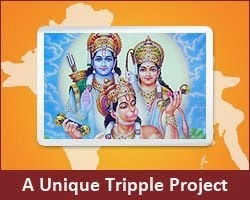 The great seers of ancient India saw so far ahead of their time that the world has to wait centuries yet to appreciate their wisdom, and it is this very inability on the part of their own descendants to appreciate the full scope of this wonderful plan that is the one and only cause of the degeneration of India. The degeneration of India came not because the laws and customs of the ancients were bad, but because they were not allowed to be carried to their legitimate conclusions. And that is why Eknathji says : We have lost good social systems as well as certain good qualities which we have to regain. Of course, there is no point in weeping over on the bygone. but we need to work hard and get back all those qualities and systems. We are the makers of our own destiny and hence, doing it by ourselves is the need. Eknathji further says : We have lost such good institutions as organization; and now if we require them, there is no shame in borrowing them from wherever they are available. Together with such systems, we have also lost certain good qualities of life. Our philosophical and secular literature is full of evidence which shows that the ancients had immense self-confidence in them.— 'Krinvanto Vishwam Aaryam' ("We will make the whole universe noble.") was their vow. They had such immense trust in themselves that if they desired and decided, they could do and undo things. They declared the immortality of the soul and accepted the potential divinity of each soul, thus facing death boldly with as great a joy as one would change the old clothes and take new ones. What grief is there and why weep when one changes the garments? We are born and therefore we must die, and die not eternally but die to be born again with a new body with all the vigour and luster for a fresh life. This article of faith is very important and we need to imbibe in ourselves which alone will give us the self confidence that is much needed today. He says : Unionism is based on individualism and in it the view of the whole is lost. How has this happened? With the passage of time, a consciousness of difference of one individual from the other dawned on the people and under one pretext or the other, people tried to form separate groups to guard their self-interest from others. The idea of community life was subordinated to self-interest. Instead of the eternal unity in diversity, they propagated a false value of diversity without unity and so trying to change everything into uniformity. The selfishness, self interest became prominent and therefore, what could have been a boon became a curse. He says : The principle of unionism has worked wonders and we find that not only the labour is united against the capitalist, but the patients and the nurses and the doctors in a hospital have got their respective unions to fight the cause of self-interest! The concept that hospital itself is a unit as a whole and must work smoothly for the welfare of all, is completely set aside and the conflict starts among the various constituents of the hospital. And therefore, there is need to see the Unity in the whole of the creation. With that seen, the changes will take place. He says : It is as ludicrous as the limbs of the body fighting amongst themselves forgetting that one cannot exist without the others, while they together constitute what is described as a body. But queer ideas of differentiation are invented by the people forgetting that differences are unavoidable in nature. Man is not manufactured and made to order as a machine. The differences are not a curse, but a boon for the corporate organized community life. Mutual cooperation and dependence create sympathy and harmony. Hindu view of varna system provides equal opportunity for all, making allowances for all differences. "In the Rigveda, one hardly finds a Rik where anything is prayed and demanded for an individual. It is always "of us" (न:) and not "my". The well-known Gayatri Mantra prays for "the intellects of all of us to be illumined". The sage in the Tenth Mandala says, "You all go together, speak together and let all your minds know things together" etc. (RV X.191.3-5). The great National Anthem of Yajurved speaks for the whole nation and its manifold constituents simultaneously and not individually for one person. 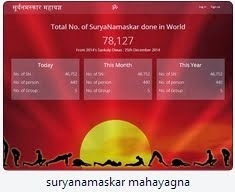 The celebrated Shantimantras of the Upanishads pray for the community as a whole and never for any one person"
The website has been started on Rashtra Chintan Diwas, a First day of Samartha Bharat Parva, and till now 12,85,325 Suryanamskars have been registered. When does the battle of life emerge?